he will receive the crown of life, which the Lord promised to those who love him. God has made a promise to all those who love Him. He has promised each one of us a crown of life that we will wear for eternity! Because our Heavenly Dad never makes duplicates, I can only assume that each crown will be uniquely crafted and custom-fitted for the wearer. 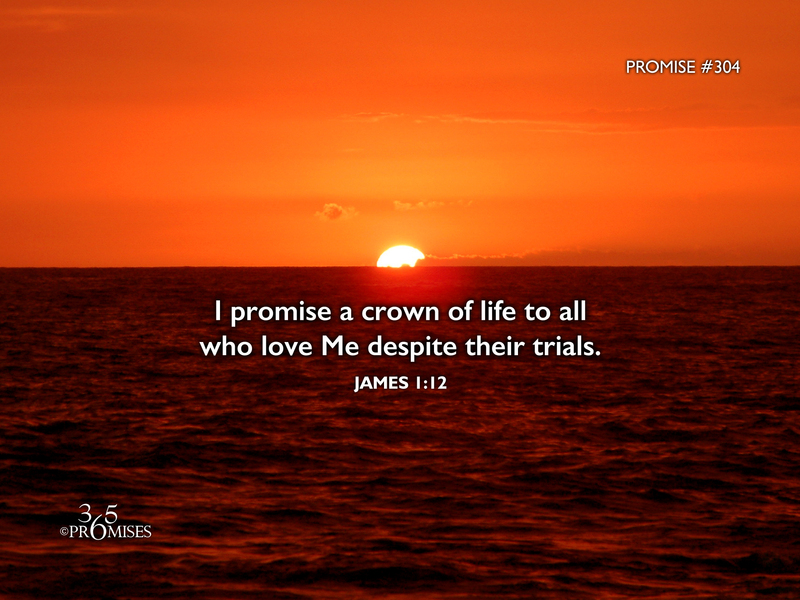 I find it interesting that James speaks about the promise of a crown in the same verse where he talks about persevering under great trial. Perhaps the greater the trials, the bigger the crown? I don't have a theological coat rack to hang my hat on for this one, but I do know that God's heart is for the under privileged and the marginalized. In chapter 2:5 James goes onto say... Listen, my dear brothers: Has not God chosen those who are poor in the eyes of the world to be rich in faith and to inherit the kingdom he promised those who love him? (NIV) So be of good cheer today. If you are suffering under great trials, God understands. He sees everything you are going through and He promises a crown of life for all that love Him. So don't give up, keep on going, for one day we will all be wearing a crown of life created for us by our loving Father.